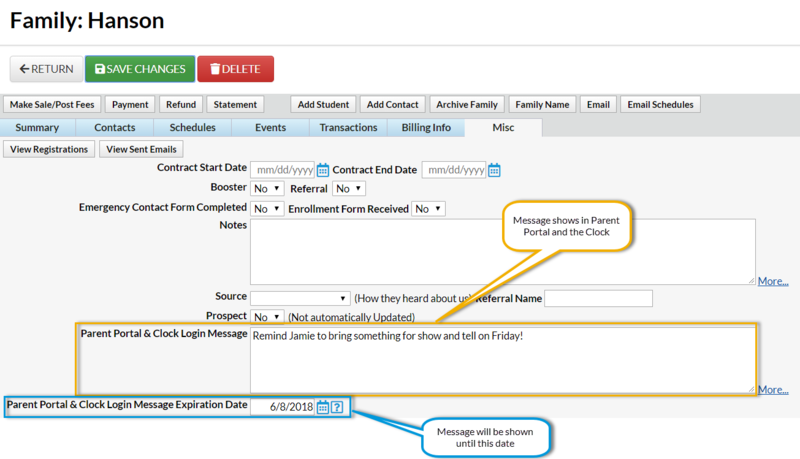 Add your message as text in the Parent Portal & Clock Login Message section. Enter an Expiration Date to have this message appear each time a family enters the Portal or Clock. It will not display after the entered date. Leave the Expiration Date blank to have this message show only one time. The Balance is shown to the Billing Contact after they enter their clock PIN. Only one contact can be designated as the Billing Contact on each Family/Account and they are the only contact who will see the balance when clocking in and out.